The magazine is the official publication of the Tree Care Industry Association in the USA and has a circulation of approximately 24,000. The article can be accessed here. The Tree Care Industry Association [formally the National Arborist Association] has been established for over 75 years and is the professional trade body in the USA lobbying for and promoting professional arboriculture and tree care to the general public, training and education for those within the trade and the necessity of proper safety and health procedures and practices within what is inherently one of the more dangerous professions. The company said, “Brown and Company Ltd. was awarded Accredited Contractor status in 2013 following an approximately eight month process during which there was a rigorous review of the management and operation of Brown and Company Ltd.
“Not only were their standards and quality of workmanship studied to ensure they operated to industry leading standards, but the TCIA also reviewed their entire management systems and company policies from safety and health, through accounting, fair business practices, human resource management and fair employment practices, staff training and development, insurance, customer satisfaction, etc. “This all culminated in a three day site visit by an independent external verifier during which all of the above were observed and confirmed first hand. In doing so Brown and Company Ltd. become the first international company to be accredited by the TCIA and join the ranks of one of only approximately 400 companies throughout North America to achieve this status. 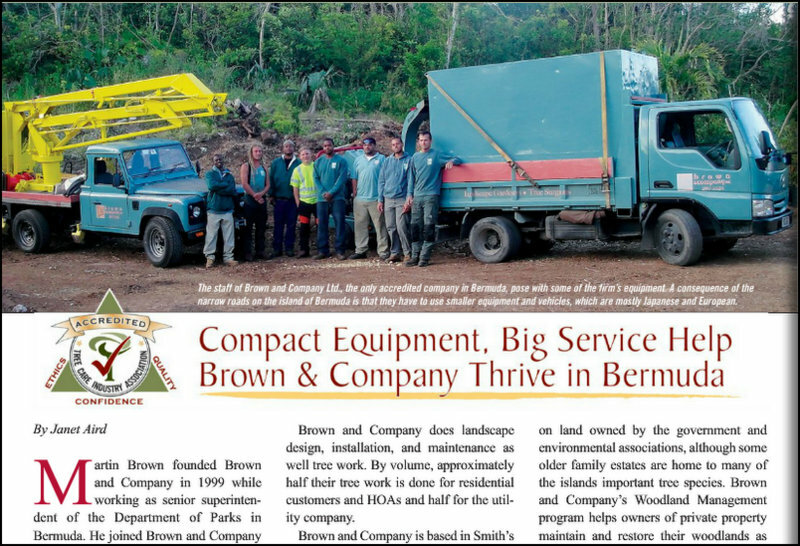 Brown and Company Ltd. is pleased to continue offering Bermuda professional landscape and tree care services to industry leading standards.